Susan Hayward was born in Brooklyn in 1917, and passed with brain cancer in 1975. She began her career in modeling before becoming an actress. In 1937 she tried out for the role of Scarlett O'Hara in Gone With the Wind, but didn't get that part. But it was only a beginning for her as she went on to star in many Hollywood productions. We share with you some of her early modeling work in swimsuits. They called her affectionately 'Red', as that was her hair color. Isn't she beautiful? 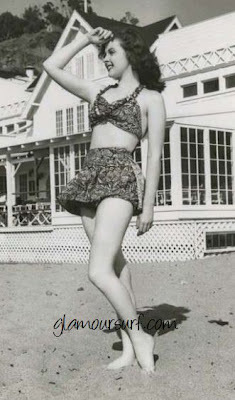 Wow, I didn't know that Susan Hayward was originally a model. These pics are gorgeous. She was a fabulous actress too.